Ask a C1 Truck Driver Training graduate where they went to truck driving training, and they'll happily tell you. That's because the truck drivers that go through our truck driving training find that the experience they got becomes invaluable - from the knowledge learned, to the relationships made. At our Springfield truck driving training facility, we'll provide you with a concise, proven curriculum containing the most up to date information available, as well as hands-on training and personal attention. Your truck driving training experience has to start somewhere, and at C1 we begin in a classroom setting. The CDL classroom is enhanced by hands on activities and multimedia presentations. 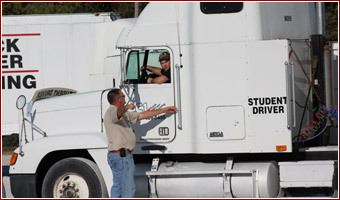 CDL instructors that lead the lectures have over five years of experience as truck drivers and understand the industry. 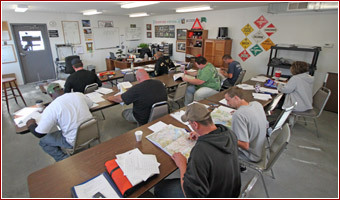 In the truck driver school classroom, you'll learn map reading, logging, trip planning, and other essential CDL skills. C1 Springfield offers a well-organized, closed driving range where students can learn and practice basic maneuvers with a semi in a safe, supervised environment. Students will learn shifting techniques, coupling the trailer, backing skills, left and right turn techniques, and the pre-trip inspection of a truck. The CDL instructors on the driving range emphasize the skills needed to pass the CDL skills test at the end of truck driving training. Instructors will work with students on specific skill sets until they're confident. Training trucks in the C1 Springfield fleet are well-maintained, conventional vehicles like the ones you'll work with when you're out on the road. Once you learn the basics, it's time to put them to practice on local roads and interstates. When you hit the road with a CDL instructor by your side, you'll put everything you've learned so far into practice while working on defensive driving skills, turning techniques, and using commentary methods while driving. You'll get ample time behind the wheel as you get more comfortable and confident controlling the truck. Safety and confidence go hand-in-hand, so C1 works hard to make sure that your truck driving training experience is positive and helpful. While you're at truck driving training, you'll have constant access to CDL training and trucking industry professionals and veterans to answer questions along the way. They'll work with you to refine your skill set and focus on the CDL skills test. After three weeks of training, C1 will administer a test similar to the CDL skills test to let you know that you're ready to move on - or show you where you need to practice a little bit more. C1 Springfield's main focus is for you to become a safe, professional truck driver, so they'll work with you on any areas you might need. At C1, you'll always know where you stand in the process of becoming a professional truck driver. Truck driving training is a big challenge, but when you go to C1 Springfield, you'll find that our staff of full-time CDL instructors, paired with our customized curriculum and detailed training procedures will definitely make your truck driving career more than just a dream. The passion of our truck driver school team is unmatched by other schools in the industry. You aren't just a number at our Springfield truck driving training school - you're the future of the truck driver industry, and we want you to succeed.